VPN Unlimited is one of the larger VPN providers on the market with over 1000 servers spread across 70 locations around the globe. VPN Unlimited has the most locations in the US and Europe, but also has a few servers located in South America, Asia, Africa and the Pacific which is ideal for for those who frequently travel and connect to un-trusted internet connections. KeepSolid has a very simple, three plan approach designed to convince you to sign up for the Infinity Lifetime Service. At the bottom of the their is their Economy plan which is $8.99 per month billed monthly followed by their Professional plan which is $39.99 per year billed yearly and finally their Infinity plan which is $149.99 unlimited for life. All plans allow for up to five simultaneous devices and as far as I know, each of the plans offer the same features with the main difference being the price. 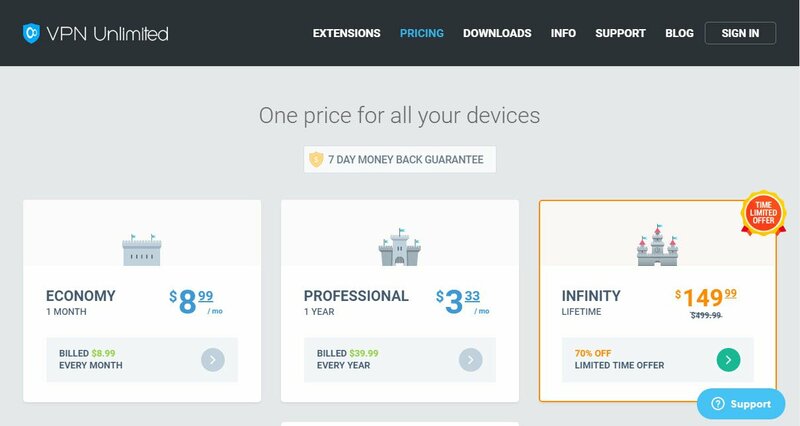 For those looking for an unlimited lifetime VPN, this is one of the cheapest on the market and with well over a decade of service, VPN Unlimited isn’t likely about to go away soon either. For power users who need more features than a standard shared VPN service, VPN Unlimited also includes additional services for a fee such as personal VPN servers, personal static IPs, additional devices and family plans as well. In order to use the VPN Unlimited service, Keepsolid provides apps for pretty much every major computing and mobile platform out including Windows, Linux, macOS, Android, iOS, Windows Phone, AppleTV, and even as a Chrome or Firefox browser extension. The software is lightweight and easy to use. After logging in, connecting to a server is a simple matter of clicking on the server and it will automatically begin connecting. Once connected, the software will show connected along with your IP as well as your new VPN IP. One thing that’s important to note is that some servers are labled “TORRENTS”. These are the only servers that work with torrents which is a bit of a letdown as only about five of these exists for all VPN Unlimited users making Torrent connections extremely slow. 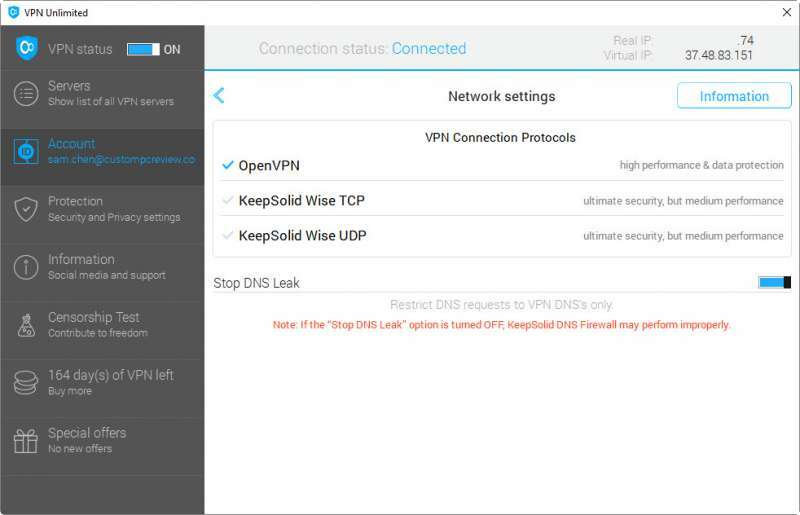 The network settings menu shows information about VPN Unlimited’s VPN protocols along with an option to stop DNS leaks. For those who want the best privacy, I’d highly recommend using the OpenVPN encryption protocol and enabling the stop DNS leak functionality. VPN Unlimited also offers their proprietary KeepSolid Wise TCP or UDP service which switches traffic to TCP port 443 or UDP port 33434 to bypass VPN blocking filters however, no information is provided as to how secure this is aside from “ultimate security, but medium performance”. Curiously missing here however is any sort of auto-connect or kill-switch feature. As a result, VPN Unlimited may expose you when you first turn on your PC as the VPN requires manually enabling the connection. On the flip side, if the connection between you and VPN Unlimited drops, you could be exposed during this period as well. VPN Unlimited’s logging policy is that they only log details such as connection attempts, session duration, bandwidth used, and clicks to the software. While VPN Unlimited does not come out and explicitly state that they do not collect personal data or usage data, they do state that they don’t give personal information to third parties, participate in any form of censorship, or cooperate with requests for information unless ordered by a court. That said, VPN Unlimited does have an exception to their logging policy where if users are conducting activities that are “illegal or unwanted”, Keepsolid may log “partial” information to “…prove the user’s innocence and protect our service.” While this shouldn’t be an issue for most users, it may be worth noting for activists or whistleblowers working against the government. 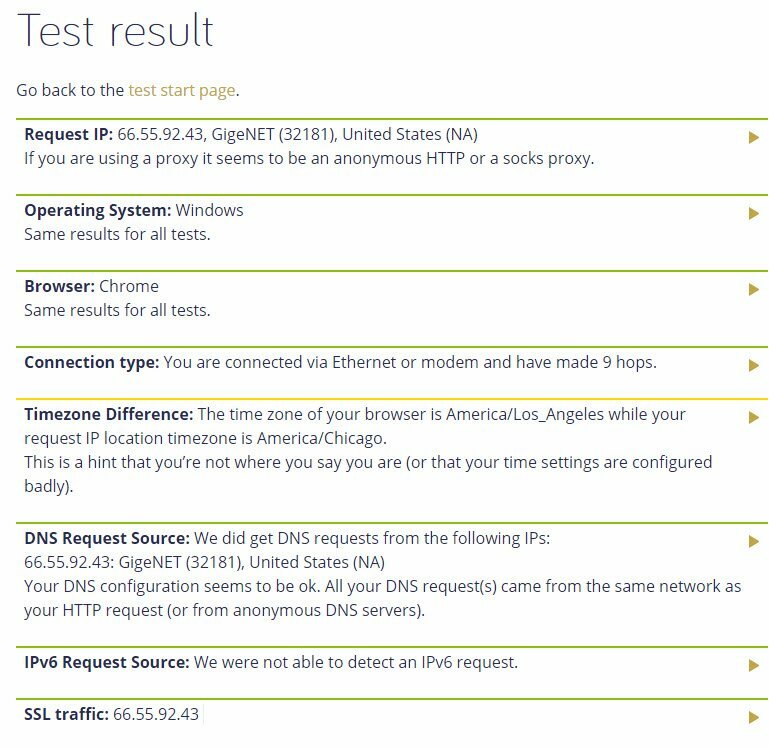 Performance testing was conducted using Ookla’s Speedtest.net website. In addition to a baseline test with no VPN enabled, each located was tested three times at three different times of the day and the speeds are averaged for the final results. VPN Unlimited servers offer usable performance however, using the service will result in a significant dropoff in terms of performance. For those with internet connections under 50Mbps, this should be OK, but those with faster internet connections should look for alternate VPN service providers. Latency on the servers is decent with the Los Angeles VPN protected test adding just 3ms of latency. Gamers looking for a relatively affordable lifetime VPN service to prevent DDOSing and other malicious activities should definitely look into VPN Unlimited. 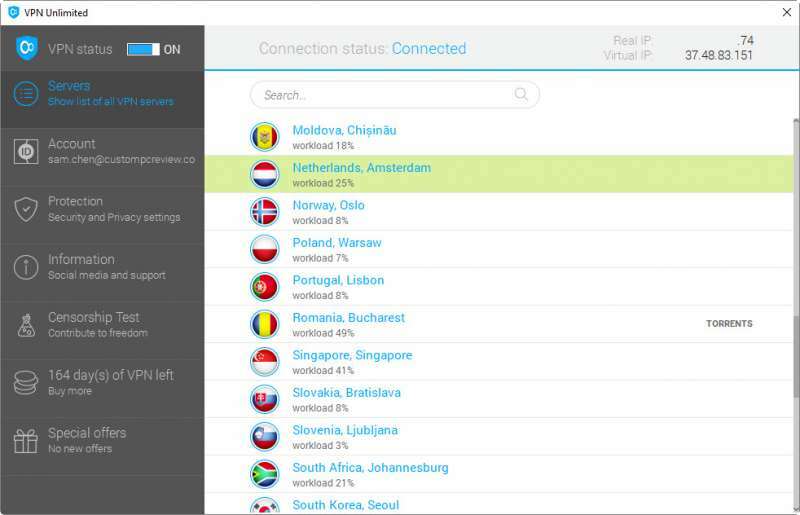 VPN Unlimited was able to provide protection against IP and DNS leaks without issue. While VPN Unlimited does use Google’s DNS, this is proxied through VPN Unlimited servers so this isn’t an issue. 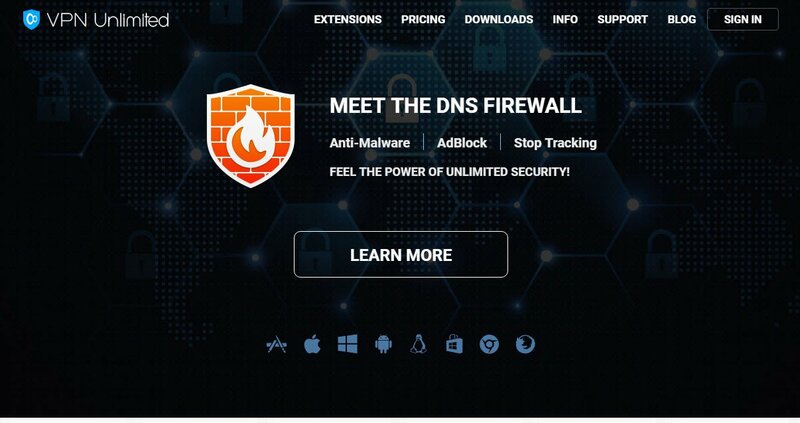 Overall VPN Unlimited is a decent VPN service for those who simply want something cheap for good online protection when out and about at the local coffee shop or while working at the airport. However, if you’re a journalist working in a hostile country or an activist working against the government and need a truly secure VPN service, VPN Unlimited is not for you. Without an auto-connect/kill-switch feature, an iffy logging policy and Torrenting support only on specified servers, VPN Unlimited falls short of being a top tier VPN service.